Yesterday, Donald Trump’s handpicked Attorney General William Barr testified before the House, where he was asked numerous questions about his coverup of the Mueller report, but largely refused to a straight answer. Today Barr testified before the Senate, where he faced more aggressive questions about the coverup – and let’s just say that this whole thing increasingly has the makings of a disaster. William Barr already destroyed his credibility when he released a glowing pro-Trump “summary” of the Mueller report which was so ridiculous on its face, even Mueller’s own team called him out for his dishonesty. So we can’t believe a word that Barr said today, but his words are nonetheless illuminating. 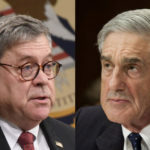 Barr is now claiming that when Robert Mueller decided not to make a decision about whether Donald Trump committed felony obstruction of justice, Mueller didn’t bother to tell Barr whether he wanted Congress or Barr to make the decision. This is, of course, a lie. There is simply no way that a seasoned and aggressive prosecutor like Mueller would have refused to make a prosecutorial decision, and refused to weigh in on who should make the decision. This means we now have to ask if Barr was lying when he claimed that Mueller made no decision on obstruction. For all we know, Mueller could have said in his report that Trump should be criminally indicted for four gazillion counts of obstruction, and Barr is desperately trying to bury that part. Barr says he’ll fully make the obstruction parts of the report public without redaction; we don’t believe him. In any case, the most disastrous part of William Barr’s testimony today was when he claimed that the federal government was spying on Donald Trump’s campaign. This is nothing short of psychotic. Trump and his campaign were routinely and clandestinely meeting with Russian government representatives, and the FBI had an absolute duty to investigate why Trump was aligning his campaign with the Kremlin. If Barr tries to prosecute the FBI for doing its job, this will end with Barr in prison for the rest of his life. In the meantime, this is more out of control than ever.